The heart of a vast industrial plantation for nearly a century and a half. Cornwall Iron Furnace is an extraordinary example of the furnaces that dotted the Pennsylvania countryside in the 18th and 19th centuries. Around it developed villages, artisans’ shops, stores, schools, churches, and the home of a wealthy ironmaster. All of the raw materials necessary for the smelting process — iron ore, limestone and wood for charcoal — were found in this self contained iron plantation. 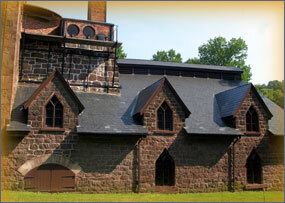 Cornwall Iron Furnace, the only surviving intact charcoal cold blast furnace in the Western Hemisphere, attests to the once great iron industry that flourished in south central Pennsylvania. In the 1730s, Peter Grubb, a stone mason, began mining nearby. In 1742, he established the furnace. He named the area Cornwall in honor of the area in England from where his father had emigrated. This furnace remained in operation until 1883. Although the British Parliament attempted in 1750 to restrict production of iron in the colonies, the output continued to rise. The American colonies, with Pennsylvania being the top producer, smelted one-seventh of the world’s iron. When Peter died in 1754, the property passed to his sons, Curttis and Peter. By 1798, Robert Coleman had gained control of the furnace operation. Robert was very successful and became one of Pennsylvania’s first millionaires. Cornwall Iron Furnace remained in operation until 1883, when newer furnace operations fueled by anthracite coal made it obsolete. The furnace was abandoned, leaving the building virtually untouched until it was given in 1932 to the Commonwealth of Pennsylvania by Margaret Coleman Freeman Buckingham, Robert’s great grand-daughter. In the mid-nineteenth century, Cornwall’s iron plantation contained industrial, residential, and agricultural activities. Small villages were created for furnace workers and miners. These stone and brick structures were simple in style but sturdy in construction. Many other structures built during this time period use a Gothic Revival architectural style. The ore mine, which continued to operate until 1973, is located just south of the furnace property. Bethlehem Steel acquired ownership of the mine between 1917 and 1922. Both strip mining and underground mining were used to extract ore from the ground. The open pit mine began to flood in 1972, and today the open pit is filled with water.